In 1889 Congress appropriated $20,000 for the purchase of land near Squan Inlet (now Manasquan Inlet) on which to build a lighthouse. It was felt that some sort of light was necessary to illuminate the long stretch of unbroken coast between Barnegat Inlet to the south and Sandy Hook Bay to the north. Since Squan Inlet was the best refuge for vessels along the coast, it was deemed an appropriate place for the erection of a lighthouse. The papers for the purchase of a site were drawn up, but before payment was made, it was discovered that the lot to be transferred was not the site selected and agreed upon by the Light-House Board and was unfit for the intended purpose. The sale was subsequently called off. Efforts to locate a new and more suitable site were begun and by 1894 were successful, but there was difficulty in obtaining a clear title to the tract located 1 5/8 miles north of the Inlet. The difficulties were resolved the following year, however and title was transferred. Construction began on the lighthouse which up until this point had been called the Squan Inlet Light-Station, in 1896, and it was completed and first illuminated the night of December 10, 1896. 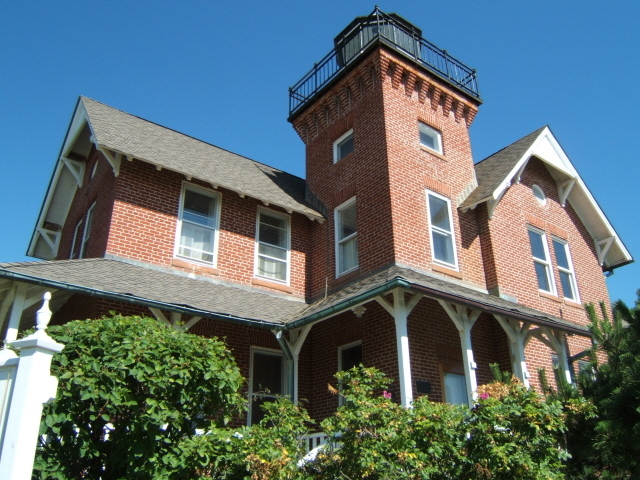 The lighthouse was described at the time as a two- story brick with tower on top, built of red brick, with lead colored shutters and green blinds. The lantern was painted black, it's top 44 feet above the ground. When first constructed the lantern was equipped with a 4th order lens having 8 sides and a vertical arrangement of bars. The lighthouse was frequently threatened by the nearby Wreck Pond (Sea Girt Inlet). In 1900, a 240 foot sand fence was installed to protect the grounds from further encroachment. In 1904, the Annual Report of the Light-House Board noted that "a sand fence was rected and kept in position during the winter. The sand that had drifted upon the lawn was removed, a quantity of fertilizing material was applied and some resodding and reseeding was done." Two years later the report stated that the "Sea Girt Inlet approached very near to the northeasterly corner of the reservation," and that "sand bags were stored at the station for use in making temporary revetments in case of necessity." An inspection report of 1907 notes that the lighthouse was 80 feet to the nearest high water mark. By the 1920's the ocean too, had encroached upon the lighthouse so the degree that the Government feared its ultimate demise. Water lapped at the foundation of the dwelling. Catastrophe was prevented with the addition of interlocking steel pilings which were installed around the seaward side of the lighthouse. In 1921, the Sea Girt Lighthouse became the first shore light-station to be equipped with a radio fog signal. Vessels equipped with a radio compass detected the transmissions with the aid of a small loop mounted above a compass. The antenna could be moved in any direction. By listening with a headset, an operator rotated the antenna until the best (strongest) signal was heard, then adjusted the frequency and took a bearing from another station. Plotting the directions of those signals on a chart, the point of intersection of those bearings is the ship's position. By listening to the characteristic signal each station was transmitting, it is possible to identify the station. There were many advantages to this new method of navigation, which was the forerunner of today's LORAN. The Sea Girt lighthouse was used until 1955, when the increased cost of continued operation, availability of more economical options, and the change of the shipping lanes to a more easterly direction were all factors in the decline of the usefulness of the lighthouse. The lighthouse was offered for sale to the state, but the state waived its priority right to purchase the property. The Borough Council of Sea Girt advised the General Services Administration that it would be interested in acquiring the property. For a time the lighthouse was used as a meeting place for various civic groups, but in 1980 a group was formed with the intention of restoring the lighthouse. 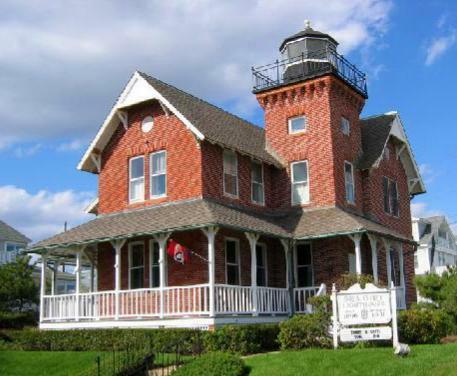 The Sea Girt Lighthouse Citizens Committee leased the property from the town for twenty-five years. The group was incorporated in 1981, and consists of over 200 members. The lighthouse is situated on Beacon and Ocean Avenues in Sea Girt, New Jersey. 1 Collins, Francis A., Sentinels Along Our Coast, (New York, New York: The Century Company, 1922), pgs. 257-258.